As stated in the previous blog post about the public API release, Scalingo has been thought as a platform. Our role is to simplify developers everyday life. To do so, they must access their favorite tools in an instant. To save your time we’ve been building an API which is really close to Heroku’s Addon API. Thanks to this, you won’t have to develop a new interface to a new platform, minor adaptations should be enough. This part describes the different endpoints which should be implemented on the provider part. Our services will request these endpoints to provision/update/deprovision addons. To integrate an addon to the platform you have to send us a manifest file at addons[at]scalingo.com. Its structure is defined in this part of the documentation. To check that your manifest is valid, we are providing this tool: github.com/Scalingo/scalingo-addon-api-tester. Thanks to it you can try your service locally before running it in production. Examples are detailed in the README.md of the project and in the manifest documentation. As provider, you can access some data from the applications which have chosen your addon. 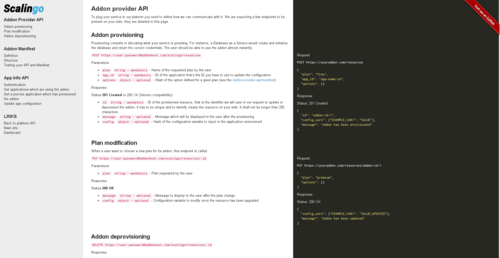 This section documents the different endpoints of our API which are available to the addon providers. One common use case is when the service you’re providing requires to modify the addon-related environment variables of an application, you can do it through this API. What’s next for addon providers? Static plans are a limit we want to remove from this link between us and providers. There are currently numerous services which have elastic plans, where people pay what they consume and not a static monthly amount. In the following months you can expect us to extend this API to allow providers to integrate this kind of offers. You’ve an awesome service for developers and you are interested in plugging it in our platform, contact us at addons [at] scalingo.com !